Objective To review systematically the evidence for an effect of long chain and shorter chain omega 3 fatty acids on total mortality, cardiovascular events, and cancer. Data sources Electronic databases searched to February 2002; authors contacted and bibliographies of randomised controlled trials (RCTs) checked to locate studies. Results Of 15 159 titles and abstracts assessed, 48 RCTs (36 913 participants) and 41 cohort studies were analysed. The trial results were inconsistent. The pooled estimate showed no strong evidence of reduced risk of total mortality (relative risk 0.87, 95% confidence interval 0.73 to 1.03) or combined cardiovascular events (0.95, 0.82 to 1.12) in participants taking additional omega 3 fats. The few studies at low risk of bias were more consistent, but they showed no effect of omega 3 on total mortality (0.98, 0.70 to 1.36) or cardiovascular events (1.09, 0.87 to 1.37). When data from the subgroup of studies of long chain omega 3 fats were analysed separately, total mortality (0.86, 0.70 to 1.04; 138 events) and cardiovascular events (0.93, 0.79 to 1.11) were not clearly reduced. Neither RCTs nor cohort studies suggested increased risk of cancer with a higher intake of omega 3 (trials: 1.07, 0.88 to 1.30; cohort studies: 1.02, 0.87 to 1.19), but clinically important harm could not be excluded. Conclusion Long chain and shorter chain omega 3 fats do not have a clear effect on total mortality, combined cardiovascular events, or cancer. Since a meta-analysis of the effect of omega 3 fats on cardiovascular morbidity and mortality in coronary heart disease suggested important benefits,13 a large intervention study has been published.14 Our meta-analysis included these new data, balanced protective effects with possible harm, assessed the effects of plant based omega 3 fats on health, included people without established cardiovascular disease, and highlighted important questions about the role of omega 3 fats on cardiovascular disease and mortality. We systematically reviewed the effects of long chain and short chain omega 3 fats (together and separately) on mortality, cardiovascular disease, cancer, and bleeding events and analysed all relevant randomised controlled trials (RCTs) and prospective cohort studies. We searched the Cochrane Library, Medline, Embase, the National Research Register, and SIGLE (to February 2002); we checked the bibliographies of included studies and contacted the authors. Articles not in English were translated. We excluded trials if they were not randomised; they had no omega 3 arm; the participants were children or were critically ill; the duration was < 6 months; the intervention was multifactorial; or data on death, cardiovascular disease, or cancer were not available. 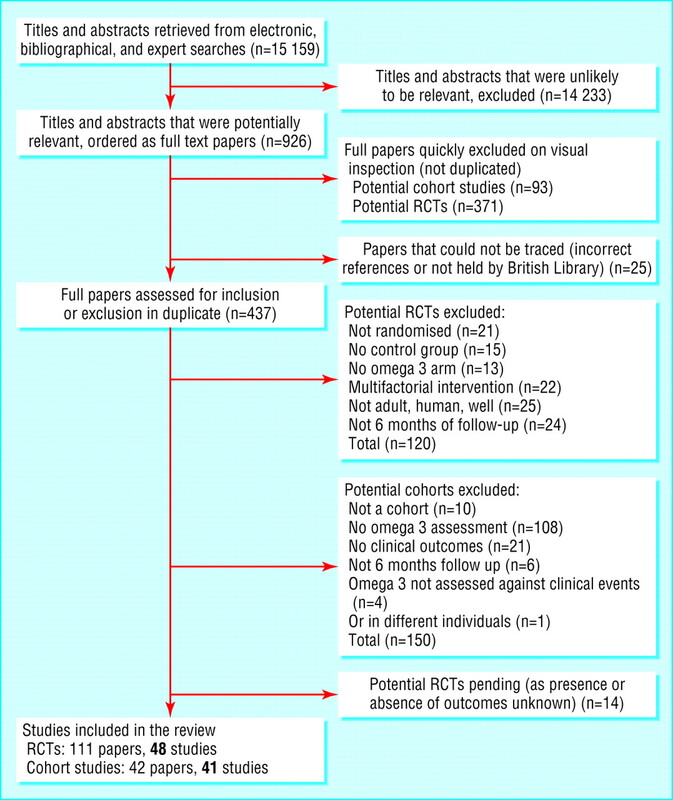 We rejected cohort studies if they did not assess the intake of omega 3, follow-up was < 6 months, or the association between the intake of omega 3 and health was not investigated. Two reviewers assessed the inclusion of articles independently, and we contacted authors for more information on methodological quality, outcomes, and further studies. Two reviewers independently extracted the data and assessed the quality of the studies. For RCTs we assessed the following quality characteristics: concealment of allocation to the study arms and the masking of participants, providers, and outcome assessors. We classed trials as having low risk of bias if allocation to the study arms was concealed and participants, providers, and outcome assessors were masked. Quality assessment of cohort studies was based on control group type, number lost to follow-up, baseline similarity, adjustment for dissimilarities, and masking. For RCTs we extracted the numbers of participants experiencing each outcome and total numbers randomised for each study arm, and combined by using relative risks in random effects meta-analysis.16 For cohort studies we used relative risk or odds ratio that had been adjusted for the most confounding factors, and we compared the most exposed quantile with the least exposed quantile. We used one analysis only for each cohort per outcome. We used subgrouping of RCTs to explore the effects on mortality, cardiovascular events, and cancer of long chain versus short chain omega 3 fats and dietary advice versus supplementation. We used random effects meta-regression to analyse the effects of the dose of omega 3 and the duration of the trial. Sensitivity analyses assessed the robustness of RCT results to trial quality by restricting the analysis to studies with low risk of bias. We screened 15 159 titles and collected 926 full text papers. Forty eight randomised controlled trials and 41 analyses of 26 cohort studies fulfilled all inclusion criteria (fig 1; for a complete set of references see bmj.com). Table 1 shows the main characteristics of the included studies. Dietary supplements were given in 44 trials (36 as capsules, six as oil, one each as liquid emulsion and enriched margarine), advice on eating oily fish in three, and advice on diet and food supplements in one. Supplements were long chain omega 3 fats (usually whole or concentrated fish oil; one small trial used refined eicosapentaenoic acid and one used refined docosahexaenoic acid), and five studies provided shorter chain omega 3 fats. Doses of long chain omega 3 fats (summing eicosapentaenoic acid, docosahexaenoic acid, and docosapentaenoic acid) varied from 0.4 g to 7.0 g per day. Control groups received vegetable oils, other fats, “inert” or ill defined substances, different dietary advice, or nothing. The intervention lasted 6-11 months in 23 studies, 12-23 months in 16, 24-47 months in eight, and ≥ 48 months in one study. Intake of omega 3 (varying combinations of eicosapentaenoic acid, docosahexaenoic acid, docosapentaenoic acid, along with α linolenic acid, supplemental fish oils, or dietary oily fish) was assessed by dietary and biochemical means in two cohorts, dietary means only in 18, and biochemical means only in 10. Groups with the lowest and highest intake of long chain omega 3 differed by 0.1-0.6 g omega 3 per day. Twenty five RCTs were rated as having a low risk of bias (table 2). Losses to follow-up were unclear in 16 cohort studies. In 15 cohort studies the outcome assessors were blinded to exposure, in two they were not blinded, and in nine blinding was unclear. In the seven cohort studies that described omega 3 intake at baseline (five assessed long chain omega 3 fats only, one short chain omega 3 fats only, and one assessed both), the characteristics of participants with high and low intake of omega 3 fats differed. People who consumed most long chain omega 3 at baseline had an advantage with regard to lifestyle (smoking, diet, and exercise), interest in health, and social factors (education, living in town). Adjustment for these potential confounding factors may not have been adequate (table 3). 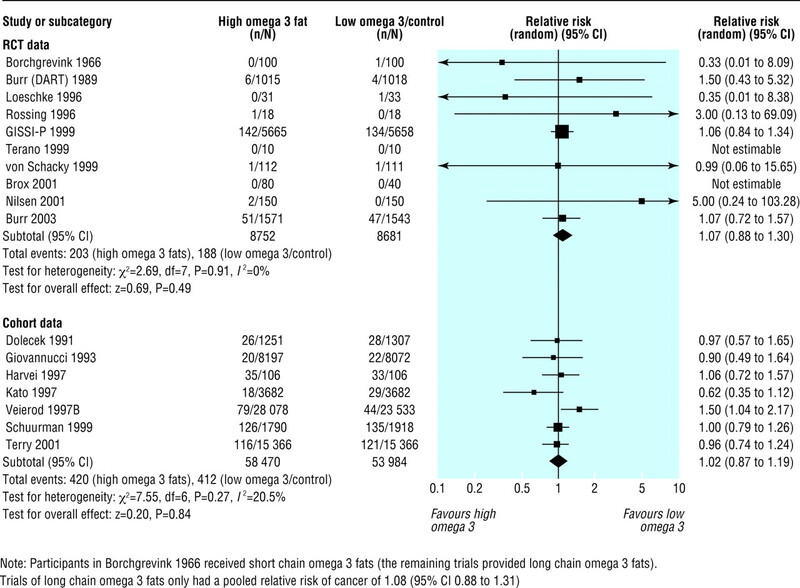 Results were similar for long chain versus short chain omega 3 (fig 2) and dietary advice versus supplements (data not shown). Meta-regression indicated that the risk of death increased as the length of the RCT increased (regression coefficient 0.008, 0.003 to 0.012). This is compatible with omega 3 fats having an early protective effect that later becomes harmful; however, the association was lost when we removed the large trial by Burr et al.14 Meta-regression did not suggest a relation between mortality and the dose of long chain omega 3. Cohort studies suggested that omega 3 protected against death (0.65, 0.48 to 0.88; I2 = 36%), but it was unclear whether adjustment for confounders was adequate. Eighteen RCTs provided data on cardiovascular events in 2628 participants. The meta-analysis showed no definite effect of omega 3 fats on cardiovascular events, but confidence intervals were wide (0.95, 0.82 to 1.12) and inconsistency was high (I2 = 65%) (fig 3). Removing studies at moderate or high risk of bias reduced but did not remove inconsistency (1.09, 0.87 to 1.37; 570 events; I2 = 49%). Subgrouping by long chain versus short chain omega 3 or by advice to eat oily fish versus supplements did not generate robust effects of omega 3 fats on cardiovascular events. Cohort studies provided no strong evidence that omega 3 fats protect against cardiovascular events. Ten RCTs reported the incidence of cancer; 391 diagnoses of cancer or death from cancer occurred in 17 433 participants (two of the trials reported no cancers). We found no evidence that omega 3 fats had an effect on the incidence of cancer (1.07, 0.88 to 1.30) and there was no inconsistency (I2 = 0%) (fig 4). Five trials and seven events remained on sensitivity analysis. Seven cohort studies provided data on cancer (832 events in the highest and lowest quantiles), and meta-analysis found no effect of high versus low intake of omega 3 (1.02, 0.87 to 1.19; I2 = 21%). Nine RCTs reported at least one stroke (243 strokes in total), but little information was available specifically on haemorrhagic stroke. 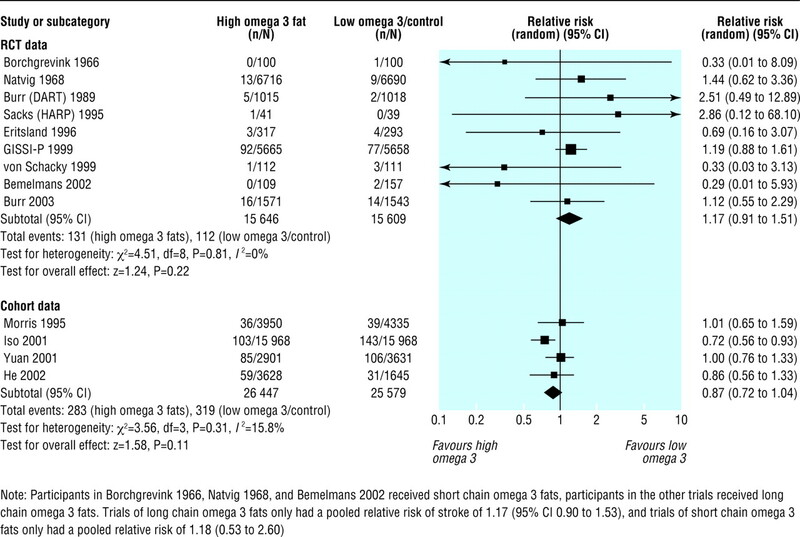 Omega 3 had no clear effect on the total numbers of strokes (1.17, 0.91 to 1.51; I2 = 0%), in sensitivity analysis (29 events), or in four cohort studies (0.87, 0.72 to 1.04) (fig 5). 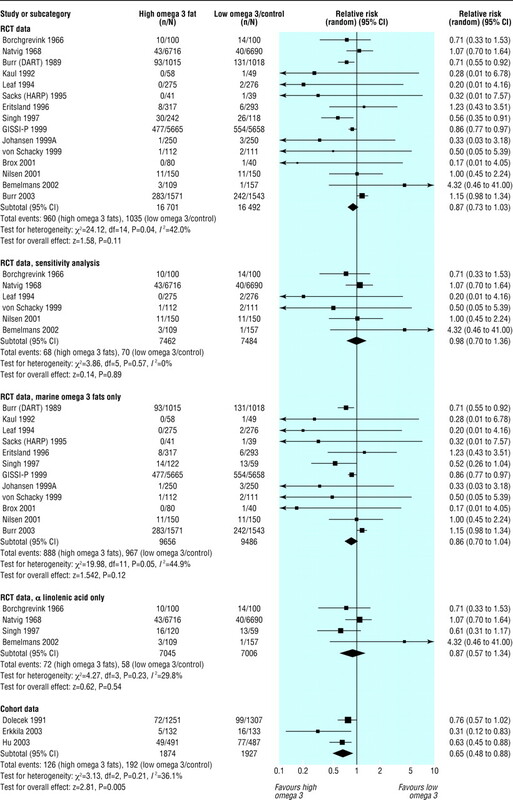 Our meta-analysis of RCTs assessing the effects of increased omega 3 fats on total mortality found substantial variations between studies. Studies with stronger methodology had more consistent results, and the pooled relative risk of these studies was 0.98 (0.70 to 1.36; 138 events). We found no evidence from RCTs or cohort studies that omega 3 fats have an effect on combined cardiovascular events. Neither RCTs nor cohort studies showed significantly increased risks of cancer or stroke with higher intake of omega 3, but there were too few events to rule out important effects. The largest studies reviewed had greater potential for bias than some of the smaller ones. We hoped that pooling studies at low risk of bias might provide enough power to inform us of effects on health, but this was not the case (only 138 deaths and 570 cardiovascular events). Similarly, analysis of the effects of omega 3 on rarer outcomes such as stroke had insufficient power to detect clinically important effects. Unlike previous metaanalyses, we reviewed systematically the effects of omega 3 fats on mortality, cardiovascular disease, cancer, and bleeding events and analysed all relevant RCTs and prospective cohort studies. We also accounted for differences in study quality and examined the effects of long chain and short chain omega 3 fats in a wide group of participants; this provides high quality evidence to guide policy and practice. A recent meta-analysis assessed the effects of consumption of fish on stroke in cohort studies and found that people who ate white or oily fish at least once a week had a significantly reduced risk of stroke.24 We excluded cohort studies that assessed only total fish intake (as this is not clearly related to omega 3 intake). The web of lifestyle, interest in health, and social factors (health patterning) seen in the cohort studies included in our review provides an advantage to people taking most long chain omega 3 fats, and this makes adequate adjustment for confounding difficult, if not impossible. Thus, we must rely on high quality RCTs to provide non-confounded answers about the effects of omega 3 fats on health. Some effects of fish on health may be due to components other than omega 3—for example, selenium or vitamin D.
It is not clear whether long chain or short chain omega 3 fats (together or separately) reduce or increase total mortality, cardiovascular events, cancer, or strokes. Our findings do not rule out an important effect of omega 3 fats on total mortality, as robust trials at low risk of bias reported few deaths. There is no evidence that the source (dietary or supplemental) and dose of omega 3 fats affected the effectiveness of long chain omega 3 fats. UK guidelines encourage the general public to eat more oily fish, and higher amounts are advised after myocardial infarction (supported by trials after myocardial infarction).20 25 26 This advice should continue at present but the evidence should be reviewed regularly. It is probably not appropriate to recommend a high intake of omega 3 fats for people who have angina but have not had a myocardial infarction. Adjustment for lifestyle factors appeared to be inadequate in the cohort studies, so policy and lifestyle decisions should be based on data from RCTs. To understand the effects of omega 3 fats on health, we need more high quality RCTs (with adequate concealment of allocation and masking of participants and health providers) of long duration that also report the associated harms. Thanks to Theresa Moore and Margaret Burke from the Cochrane Heart Group, and to all of the authors of primary studies who helped us build up the data. This paper is based on a Cochrane review accepted for publication in The Cochrane Library (see www.theCochranelibrary.net/ for information). Contributors All authors commented critically on the manuscript and agreed the final version. NEC helped design the review, provided a clinical perspective, and commented on the analysis and interpretation. GDS helped design the review, provided a methodological perspective and general advice, and commented on the analysis and interpretation. PND provided a methodological perspective and expertise on omega 3 biochemistry, and commented on the analysis and interpretation. SBJE helped design the review, provided a methodological perspective and general advice, and commented on the analysis and interpretation. RAH screened retrieved papers against inclusion criteria, appraised quality of papers, abstracted data from papers, provided general advice, and commented on the analysis and interpretation. JPTH helped design the review, provided a statistical perspective and general advice, and commented on the analysis and interpretation. LH conceived the review, designed and coordinated the review, developed the search strategy and undertook searches, screened the search results, organised retrieval of papers, screened retrieved papers against inclusion criteria, appraised study quality, abstracted data from included papers, wrote to authors and experts for additional information, managed the review data, entered data into RevMan, analysed and interpreted the data, and was the primary author. HJM screened retrieved papers against inclusion criteria, appraised quality of papers, abstracted data from papers and commented on the analysis and interpretation, ARN commented on the protocol, provided additional relevant articles, screened retrieved papers against inclusion criteria, appraised quality of papers, abstracted data from papers, and was involved in discussing the findings, interpreting the data, and writing up. RAR helped design the review, screen retrieved papers against inclusion criteria, appraise quality of papers, and interpret the data, provided general advice, and commented on the analysis and interpretation. CDS helped design the review, screen retrieved papers against inclusion criteria, appraise quality of papers, and abstract data from papers, and commented on the analysis and interpretation. RLT helped design the review, screen retrieved papers against inclusion criteria, appraise quality of papers, abstract data frompapers, provide general advice, and comment on the analysis and interpretation. HVW helped in the analysis and interpretation of the data and provided a methodological and statistical perspective and general advice. LH is guarantor. Funding A northwest research and development research fellowship (UK Department of Health) and the British Dietetic Association. Competing interests NC has received fees for speaking by Solvay Healthcare, who market Omacor.
. Plasma lipids and lipoproteins in Greenlandic west coast Eskimos. Acta Med Scand 1972;192: 85–94.
. Omega-3 fatty acids: comparison of plant and seafood sources in human nutrition. J Am Diet Assoc 1991;91: 331–7.
. Omega-3 fatty acids: their role in the prevention and treatment of atherosclerosis related risk factors and complications. Int J Clin Pract 2003;57: 305–14.
. Association of n-3 polyunsaturated fatty acids with stability of atherosclerotic plaques: a randomised controlled trial. Lancet 2003;361: 477–85.
. Antiarrhythmic effects of n-3 fatty acids: evidence from human studies. Curr Opin Lipidol 2004;15: 25–30.
. Omega 3 fatty acids and cardiovascular disease—fishing for a natural treatment. BMJ 2004;328: 30–5.
. Dioxins and PCBs in the UK diet: 1997. Total diet study samples. London: Food Standards Agency, 2000. www.foodrisk.org/dioxin_pcb_exposure.cfm (accessed 13 Mar 2006).
. Concentrations of metals and other elements in marine fish and shellfish. London: MAFF, 1998. archive.food.gov.uk/maff/archive/food/infsheet/1998/no166/166vege.htm (accessed 13 Mar 2006).
. Dioxins: chemical analysis, exposure and risk assessment. Utrecht: Universiteit Utrecht, 1997.
. Dioxin revisited: developments since the 1997 IARC classification of dioxin as a human carcinogen. Environ Health Perspect 2004;112: 1265–8.
. Mercury, fish oils, and the risk of myocardial infarction. N Engl J Med 2002;347: 1746–53.
. Organic mercury compounds: human exposure and its relevance to public health. Toxicol Ind Health 2002;18: 109–60.
. N-3 polyunsaturated fatty acids in coronary heart disease: a meta-analysis of randomized controlled trials. Am J Med 2002;112: 298–304.
. Lack of benefit of dietary advice to men with angina: results of a controlled trial. Eur J Clin Nutr 2003;57: 193–200.
. Omega 3 fatty acids for prevention and treatment of cardiovascular disease. 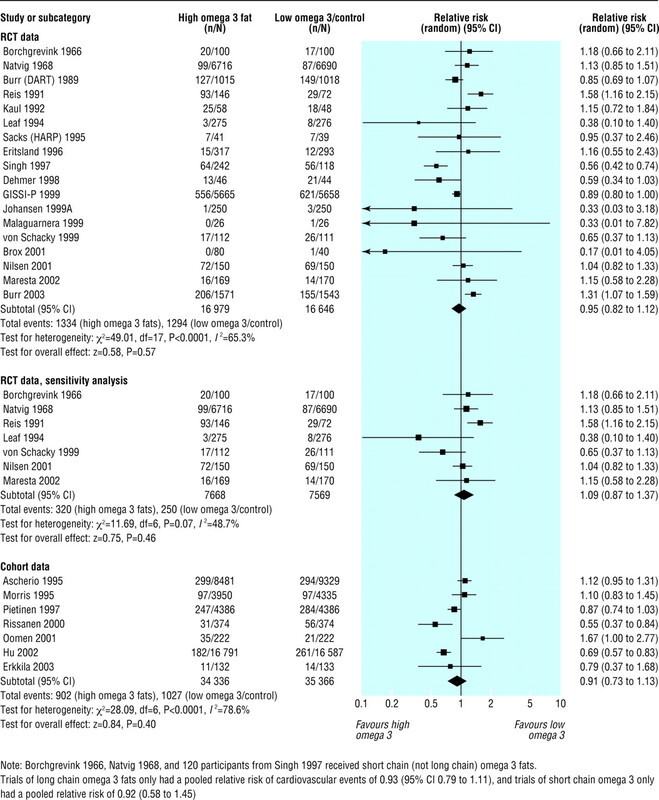 Cochrane Database Syst Rev 2004;4: CD003177.
. Meta-analysis in clinical trials. Control Clin Trials 1986;7: 177–88.
. Measuring inconsistency in meta-analysis. BMJ 2003;327: 557–60.
. Effects of omega-3 fatty acids on cardiovascular disease. Rockville, MD, USA: Agency for Healthcare Research and Quality, 2004. Evidence Report/Technology Assessment 94. www.ncbi.nlm.nih.gov/books/bv.fcgi?rid=hstat1a.chapter.38290 (accessed 13 Mar 2006).
. Advice on fish consumption: benefits and risks. London: Stationery Office, 2004. www.food.gov.uk/multimedia/pdfs/fishreport200401.pdf (accessed 13 Mar 2006).
. Dietary supplementation with n-3 polyunsaturated fatty acids and vitamin E after myocardial infarction: results of the GISSI-Prevenzione trial. Lancet 1999;354: 447–55.
. Early protection against sudden death by n-3 polyunsaturated fatty acids after myocardial infarction: time course analysis of the results of the Gruppo Italiano per lo Studio della Sopravvivenza nell'Infarto Miocardico (GISSI)-Prevenzione. Circulation 2002;105: 1897–903.
. Effects of changes in fat, fish, and fibre intakes on death and myocardial reinfarction: diet and reinfarction trial (DART). Lancet 1989;2: 757–61.
. Fish consumption and incidence of stroke: a meta-analysis of cohort studies. Stroke 2004;35: 1538–42.
. Joint British recommendations on prevention of coronary heart disease in clinical practice. Heart 1998;80: S1–29.
. Cardiac rehabilitation: a national clinical guideline. Edinburgh: SIGN, 2002. www.sign.ac.uk/guidelines/fulltext/57/index.html (accessed 24 Feb 2006).